It just seems like yesterday that Etsy burst on the scene and helped crafters and artist all over the world find a profitable (or at least a break-even) way to pawn their wares and see their creative visions come to life. Today I am so excited to offer 3 treats from some of my favorite Etsy sellers. 1 Custom Made Camera Strap Colver by Jemimah B. 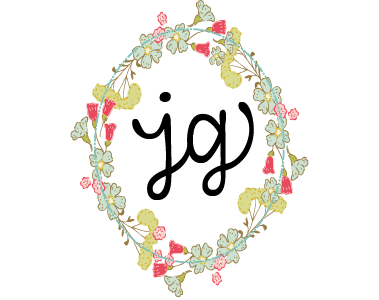 Check out my sister Jemimah’s shoppe – Making and look thru her current and sold items to see all the great creations she has made. I have 2 of these strap covers and I LOVE them both! 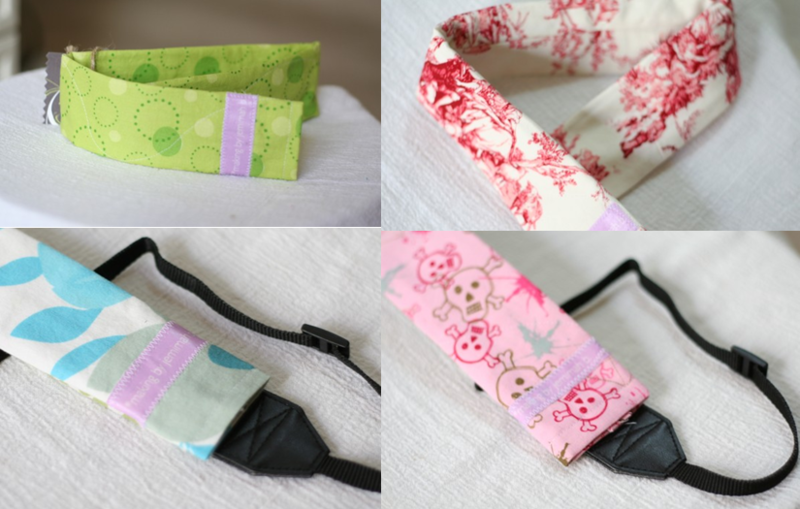 Because Jemimah is a professional photographer she knows exactly what makes a great strap cover! Today’s winner will be able to either pick a strap from Jemimah’s shoppe OR they can choose from a large selection of fabrics and order a custom cover. Visit Making by Jemimah B and her blog to see just how truly creative she is! 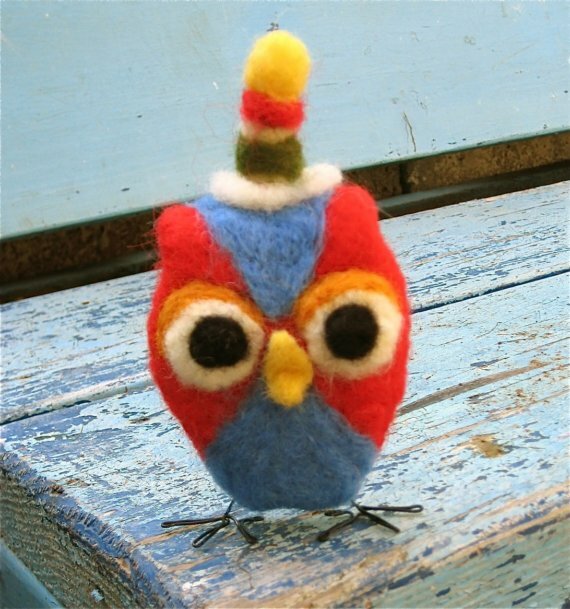 Next up is this adorable creature handmade by the ubber talented Karin Grow. Stewart, the wide-awake night owl, is looking for a loving home and today’s winner will be just the home he is looking for! Check out Karin’s etsy shoppe and all her amazing artwork. Also make sure to check out her blog where you can see her colorful house and many more projects! 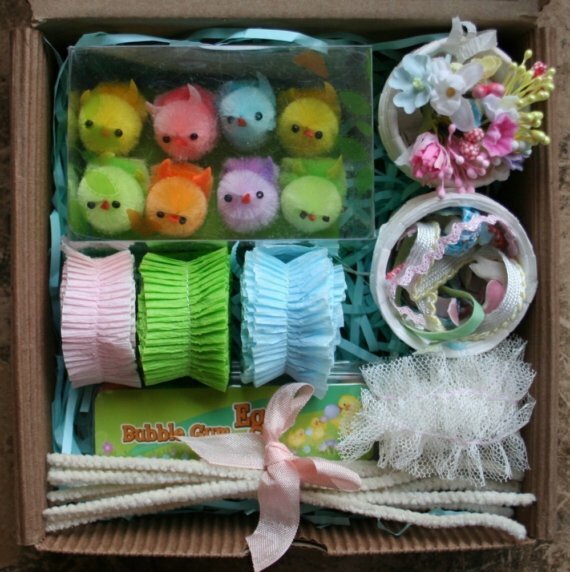 Last but not least is this amazing collection of Easter basket making goodies! This basket by Julie Collings may look like it is all about Easter but I would love to win all these goodies ANYTIME! Every little bit and peice in this basket has been chosen with love and could be use for many, many adorable projects – not just for Easter. Make sure to check out Julie’s shop full of eye candy and inspiration and go visit her precious blog – you will not be disappointed! 4) Blog about this giveaway and leave me a link to share in the comments. what sweet gifts…count me in! I like to shop Etsy mainly for hand made craft items. I shop a lot on Etsy, mostly for vintage goods. It's my favorite on line shopping! love buying handmade gifts on etsy. so sweet of you to do a give-away. of course, i'm a follower of your lovely and creative blog. love etsy for patterns, art, vintage goodies, and handmade goods. I am a new follower to your blog and look forward to looking back at past posts! I love to shop etsy for vintage items and things to use in my crafting. Love all your sweet giveaways. Great giveaway – wow! I love etsy – mostly for vintage supplies. Hope I win! … and I'm a follower too! I shop Etsy for both handmade and vintage giftsnand crafting supplies. I shop Etsy mostly for myself and when I don't have time to make gifts for friends and family. I need to become a follower of your blog after I post this! Thanks for the chance in your scrumptious giveaway! I think this is the first time I have visited your blog… I came over from Julie's which I visit regularly, so I will have a look around! My favourite thing to 'buy' from Etsy is inspiration… it's free and I enjoy the window shopping! I'm back because I did not leave a comment to say what I shop Etsy for. Mostly, I shop for vintage items…lace, trims, vintage children's books, and then I love handmade altered dolls, all sorts. I do have quite a collection from various professional doll makers. There is quite an incredible array of talented doll artists on Etsy. Please come to my blog as my latest post is about two doll ning sites I am a member of. I love everything on etsy. inshop etsy for jewellery and clothes! I love to shop etsy for paper ephemera and vintage kitchenware or handcrafted art. Anything goes! I am a new subscriber to your blog after months of viewing. Thank you for sharing! What a great theme…love etsy especially crafts or art from Julie…what an artist! Cute springy giveaway. Very sweet. I love to peruse vintage goodness on etsy. I heart that Easter kit! I shop Etsy for vintage housewares & decor. I love Etsy for one of a kind creations! I like to shop etsy for vintage items. Etsy makes me feel good … all that creativity!! Thanks for the give away! Really sweet items! I'm a **new** follower on Reader! I love Etsy for all things cute (softies, peg dolls, etc etc), unique items, hand made cards and papercrafts, what have ya! It's all good! I'm totally following your very fun blog!!! I love everything about etsy AND blogs! It allows me to connect with artists around the world! I love to shop for crafting supplies! I shop etsy quite a bit…I love to buy vintage supplies for my art (like that wonderful set from Julie!) I love to buy handmade things…and I love to buy vintage household goodies! I am also now a follower! I like to buy supplies on etsy. And things I could in no way make myself. I can't pick just one favorite thing to shop for one Etsy! i'm a new follower…i hopped on over here from julie's blog. YAY! what a wonderful place and perfect timing for these yummy giveaways!